The Anthem game public demo took place over the weekend and, uh, it was certainly a thing that happened. Even after (mostly) sorting out its server troubles, BioWare's open world PVE shooter left a lot to be desired from those who managed to get in and play it, and while many are excited for the full release, opinions seem to be divided about whether the Mass Effect developer has another solid gold hit on its hands. 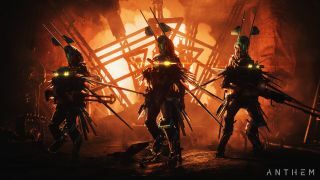 Anthem is scheduled to launch in just under three weeks time, on February 22, for PC, PS4, and Xbox One but, until then, here's a round-up of what the internet thought of BioWare's latest, including the best put downs and celebrations of everything the demo contained. Be warned; you may find yourself in strong disagreement with some of the opinions below but, hey, isn't that what the internet's all about? What is going on with Anthem's story? One of the biggest sore points about Anthem so far has been the mystery surrounding its story. BioWare has deliberately stayed quiet about certain details of the narrative, but - having experienced the demo's jargon-laden expository dumps of sci-fi nonsense - we're left wondering if we have another Destiny "Moon Wizard" situation on our hands. Could the people behind Mass Effect 2 and Dragon Age 4 really be capable of such drivel? Towards the end of the public demo, BioWare begin to tease that something would be happening in Anthem's free roam area, so players everywhere took to the open world to discover a giant fire storm tearing up the sky. In time, massive Titan bosses fell into the zone, letting Javelins do battle until the demo wrapped up for good, allowing BioWare to finally end the public testing phase on its own terms. According to the studio, this is just the beginning. Those who were on the fence about Anthem before jumping into the demo, for the most part, still remain unconvinced. The general consensus seems to be a big, hard "meh", peppered by those who were more taken by the core combat loop, though we have to remember that the demo was just a vertical slice of the final product, with BioWare stressing that the full experience will differ quite radically from what we've played so far. Still, the fact that Anthem has yet to blow most people away is somewhat disconcerting. But hey, people love the flying! Seriously, BioWare's flying mechanics could be the thing that transcends Anthem to God status, providing it stays this fun all the way into end game. People are still debating over the merit of the cool down system, and the studio will probably tinker with it before launch day, but the nuts and bolts of taking to the air as a Javelin are *chef's kiss*. Anthem is just one of the many big new games of 2019 to watch out for this year, alongside Days Gone, Dying Light 2, Star Wars Jedi: Fallen Order.